Microsoft made the right call by bringing back a pop-up Start menu in Windows 10, at least according to a panel of design experts. The new Start menu was named a Top Winner in the 2015 International Design Excellence Awards. The awards are given out annually by the Industrial Designers Society of America, and Microsoft’s design joins nine other products in the “Digital Design” category. It’s worth noting that Microsoft hasn’t necessarily won top-tier honors, as the IDSA won’t say until later this month which of its Top Winners have earned Gold, and which will settle for Silver. The Start screen is one of 81 products to receive Top Winner honors this year. Other tech products on the list include Adobe’s Ink and Slide tablet peripherals, Google Cardboard, and Intel’s WiDock docking system. Surprisingly enough, not a single Apple product appears on the list, aside from a set of headphones by Apple-owned Beats Electronics. 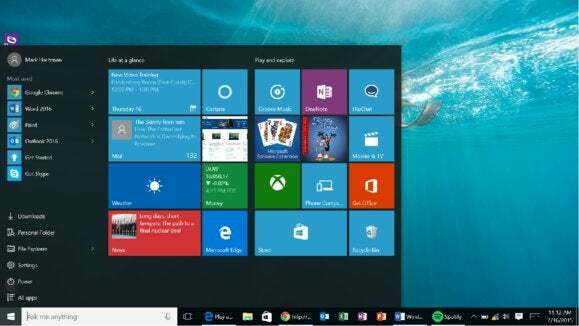 Why this matters: In Windows 8, Microsoft polarized users with a new Start menu that took over the entire screen and emphasized modern, touch-friendly apps over desktop software. While many people saw Windows 10’s pop-up menu as a capitulation, it’s more of an attempt to bridge Windows 8’s ideas with the more familiar system of previous versions. Design gurus are giving this approach their stamp of approval, even if it’s unlikely to please everyone.